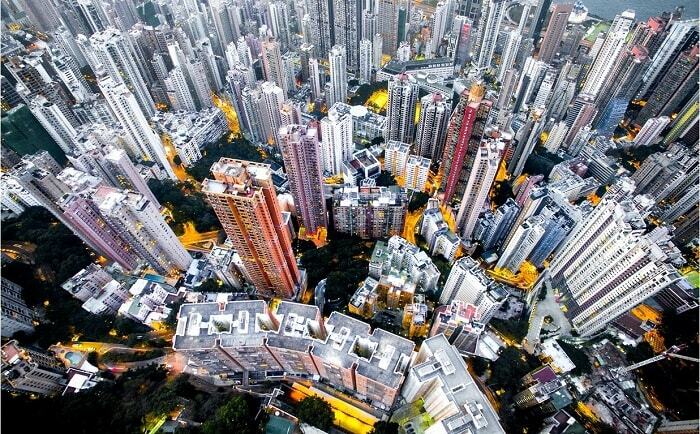 The world is predominantly urban. More and more people choose cities as a place to live. 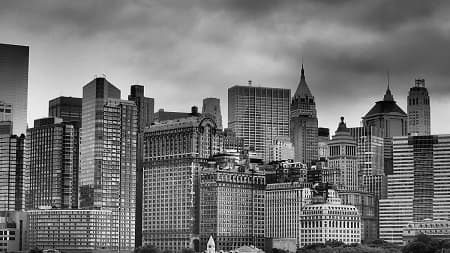 To be more precise, about 54 percent of the world’s population lives in the cities of this world and the trend continues upwards. It is a huge challenge and we should give a lot of attention to the burning issues, e.g. affordable housing, Green Building or air pollution. 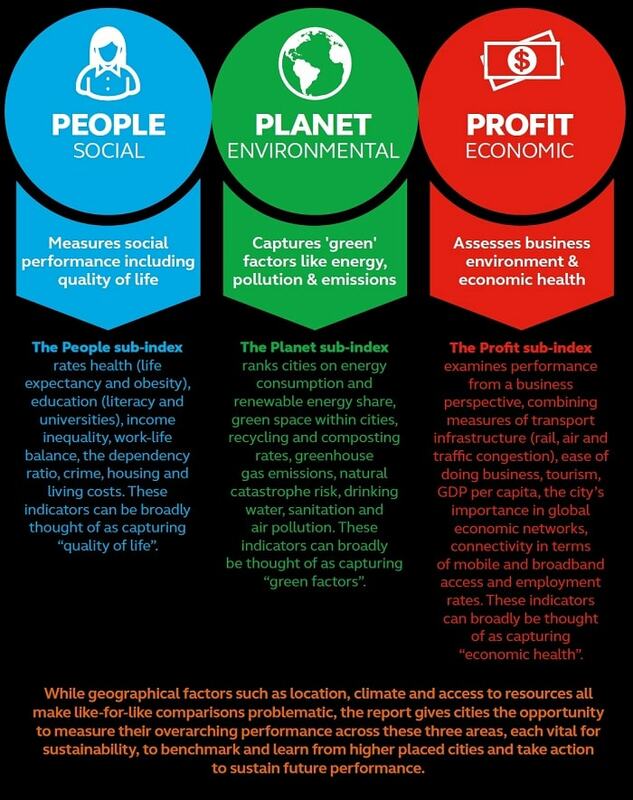 Cities around the world are struggling to achieve a balance in the three pillars of sustainability. 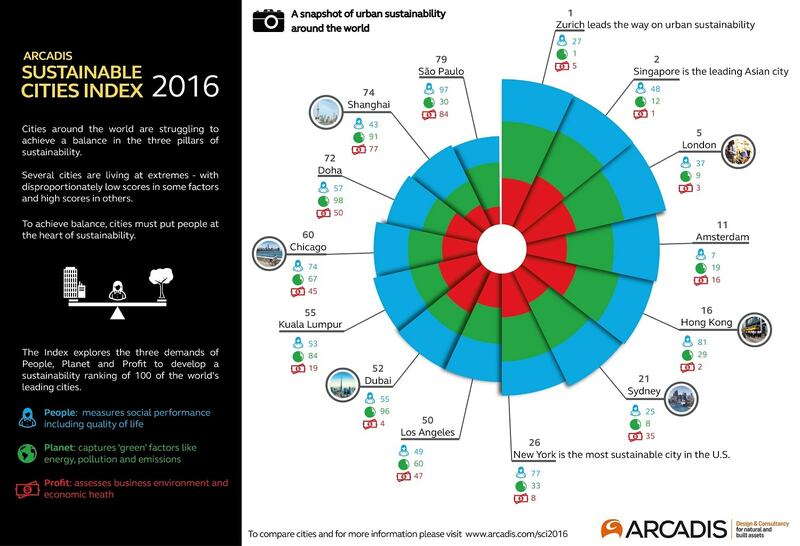 The today published study Sustainable Cities Index 2016, compiled for Arcadis by the Centre for Economic and Business Research (Cebr), ranks 100 of the world’s leading cities. 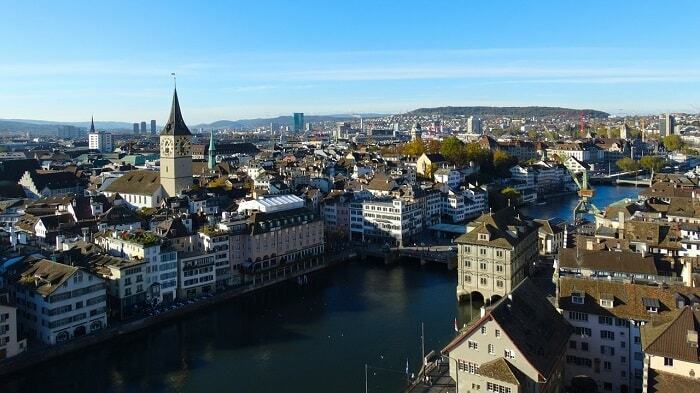 Zurich, Singapore and Stockholm are on the top of the overall Sustainable Cities Index.  “However, as our index shows, all have their urban challenges and none of the cities can claim to have earned the title of being a completely sustainable city. For city authorities grappling with their own issues, the opportunity to compare their sustainability with similar cities which are often outside their own countries is an appealing one.” John Batten adds. 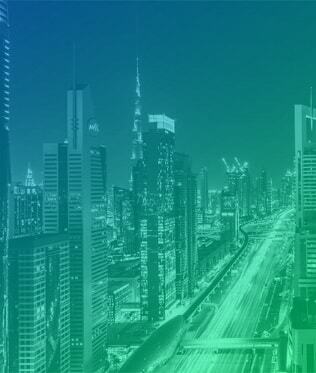 To develop a sustainability ranking of 100 of the world’s leading cities, the Sustainable Cities Index 2016 evaluates cities by examining the condition and performance of each of the three sub-indexes: People, planet and profit. Extremes in each are no exception. There are cities with disproportionately low scores in some indicators but high scores in others. 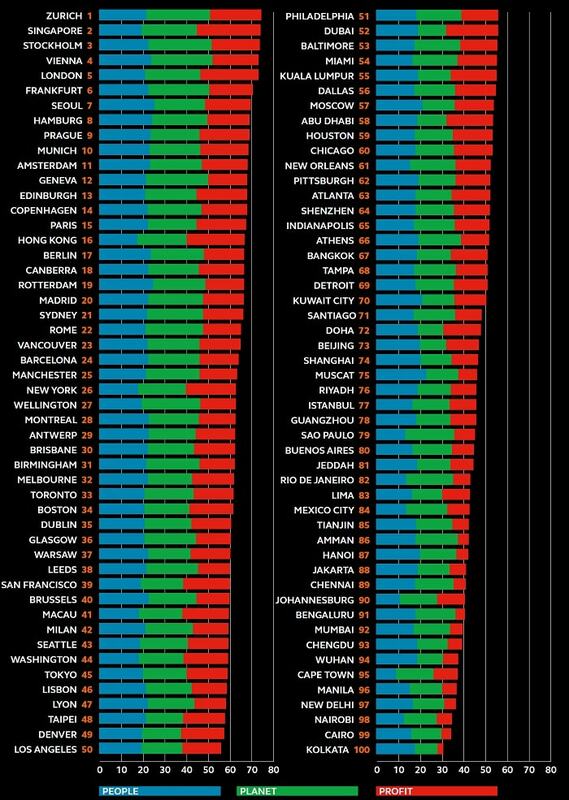 For example, London is well placed for planet (9th) and profit (3rd) but lags behind 36 cities on 37th place when it comes to people. 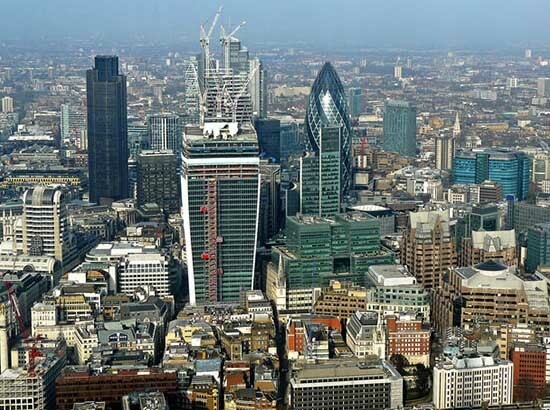 The index is dominated by Central and Northern European cities in the top positions. The environmental and social pillar are clear challenges for north American cities compared to other advanced economies. The best ranked U.S. city is New York (26th globally), followed by Boston (34th globally). The ranking of Canadian cities is better compared to counterparts from the United States. The profit sub-index seems to be the passion amongst U.S. cities: New York, San Francisco, Washington, Boston, and Denver are placed in the top quarter globally. The leader on environmental sustainability in the Middle East is Amman. Muscat is placed in the top ten globally on the people sub-index. Seoul is the leader on the people sub-index in Asia. Only four African cities are placed in the top 100: Cairo (99th globally), Nairobi (98th globally), Cape Town (95th globally) and Johannesburg (90th globally). In order to calculate the pillar’s score, indicators within each category are averaged. Received percentage scores reflect the place of a city in relation to the others. 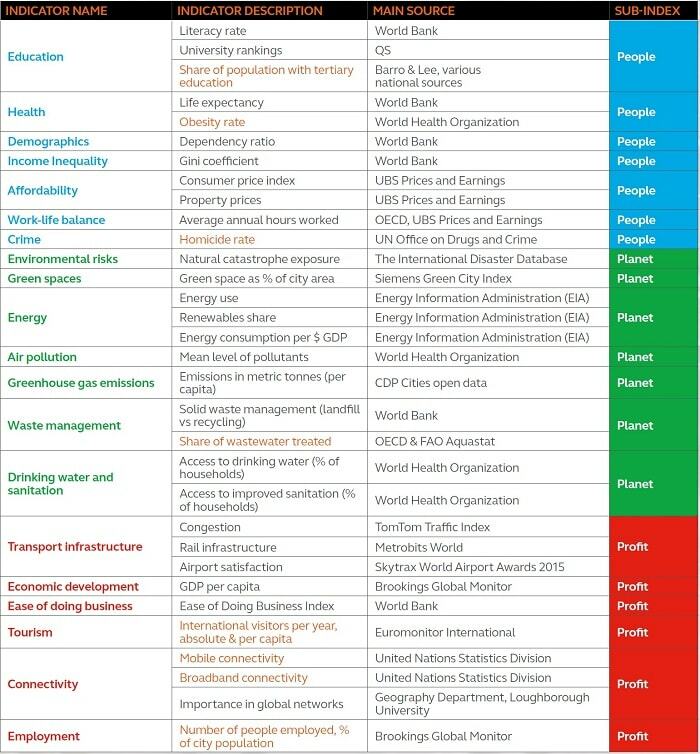 The list of indicators used in the Sustainable Cities Index 2016 is published in the study. The most changes are made in the sub-index profit. Feedback from the first report from 2015 has been incorporated.